DJ duo from New York City, Alex Pall and Andrew Taggart, aka The Chainsmokers are known for their blood rushing, fist pumping, and euphoric sounding progressive dance music. Finding fame with the single “#Selfie”, a rhythmic club anthem, the duo both celebrate and make fun of the millennial ‘selfie’ culture. Proving that they were not ‘one-hit wonders’, The Chainsmokers kept their name alive by pounding out EDM hits such as “Roses”, “Kanye”, “Let You Go” and “Don’t Let Me Down”. They are now gearing up to keep the party going with their infectious remixes and will be performing live in multiple festivals as well as in headlining concerts. 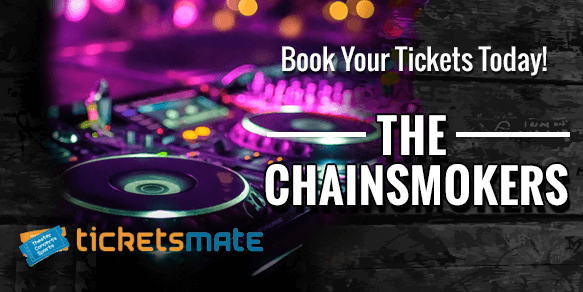 With The Chainsmokers tickets in hand, catch the duo live as they rock the stage at the 2016 KTUphoria Concert, Toronto’s VELD Music Festival and KISS 108 Concert. Puffing into existence back in 2012, The Chainsmokers landed into the mainstream with the track “#Selfie”. A worldwide phenomenon, it placed them on the EDM map and earned them a deal with Disruptor Records. Alex Pall and Andrew Taggart followed up their success in 2015 with yet another hit song “Roses” as it peaked at number 6 spot on the Billboard charts. Their debut EP came out in 2015 and reached number two position on the Billboard Dance charts. Due to their great popularity, The Chainsmokers have been invited to perform at numerous summer festivals including the KISS 108 Summer bash, Toronto’s VELD Music Festival and 2016 KTUphoria Concert. Their solo shows are also around the corner, prompting great demand of The Chainsmokers tickets. On July 30 and 31, Canada’s largest electronic music festival will set up its stage at the Toronto’s Downsview Park. VELD Music Festival will feature big names like Deadmau5, Flume, Kygo, DVBBS, Steve Aoki & Travis Scott and Martin Garrix. The Chainsmokers are among the main performers and will be treating the fans to their electrifying beats. KISS 108 FM also announced their lineup for the 2016 festival and the DJ duo will also be rocking the XFinity stage as the headliners. June 18 extravaganza will also welcome Charlie Puth, Halsey, Iggy Azalea, Flo Rida, Nelly, Troye Sivan, Daya, Mike Posner, Bebe Rexha, Melanie Martinez and Shawn Hook. Climbing the charts with their melodious hits, The Chainsmokers have found a huge fan following for their euphoric electronic dance music. After releasing a number of popular singles, the talented New Yorkers came out with their first EP “Bouquet” in 2015. It peaked at 31 position on the Billboard 200 and included five incredible tracks. The duo showed their versatility on the song “New York City”, as the gritty number featured raw, passionate vocals, powerful mood and melodic piano chords. With the tracks “Waterbed”, “Good Intentions” and “Until You Were Gone”, The Chainsmokers once again present themselves as creative juggernauts. They not just compose feel-good music but also have a great time performing it in front of a jam-packed crowd. The Chainsmokers have been selling out arenas in their live shows as hordes of fans tune in to catch them rock the stage. Their electrifying performance keeps the crowd on its feet and they show everyone a rip-roaring good time. The Chainsmokers are enjoying great success in the dance music community. The duo has released three multi-platinum selling singles, Roses, Don’t Let Me Down and Closer. They are now going on, ‘Memories Do Not Open Tour’ with Kiiara and Emily Warren this spring and will be playing shows throughout North America. The Chainsmokers will entertain the fans of EDM at venues like, the American Airlines Center, the Times Union Center, the Wells Fargo Arena and the Sprint Center among others. They will conclude their tour in June with a performance at the Queen’s Forest Hill Stadium. 2017 was indeed a good year for the American DJ duo, The Chainsmokers. They produced hit songs such as Paris and the collaborative single with Coldplay titled Something Just Like This. Although the New Year has just begun, the musicians already seem to have their plans set out. They recently teased a logo ‘TCS’ on both their Twitter and Instagram accounts. This logo which is an abbreviation of their name (The Chainsmokers) came paired with a question: “how many likes is my life worth?" This has left their fans on social media speculating as to what is the exact meaning of this question. Many assume that this might have something to do with their upcoming song or album. EDM pop-duo The Chainsmokers and rapper Drake are ruling the Billboard Music Awards nominations list. The music artists have made a new record of the maximum nominations received at these awards in a year (22). The much awaited awards show for 2017 will be aired live from the T-Mobile Arena in Las Vegas on the 21st of May. Twenty One Pilots are second behind Drake and Chainsmokers with 17 nominations while Rihanna has got a total of 14 nominations to her name. Nothing beats the joy of watching your favorite music artist perform live! The Chainsmokers's concert dates are out and fans are looking forward to the upcoming shows. The next concert will be held in Las Vegas at the XS Nightclub At Wynn Las Vegas on 19-Apr-19, while the last available date is for the event scheduled for Brooklyn at the Barclays Center on 17-Oct-19. For complete information regarding dates and venues, please visit our website. The average price for The Chainsmokers Tickets start from $163. The minimum get in price is $59 for The Chainsmokers Tickets at the Northwell Health at Jones Beach Theater, Wantagh. For a detailed look at ticket prices and amazing discounts, visit our website.